Level Editor 4 – Wild West: The fourth install of Level Editor is here. 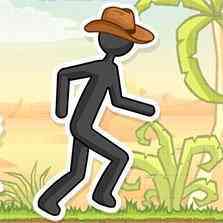 Continue to manipulate the environment to help guide your stick figure get through each level safety and reach the exit. Use your brain to solve through each level by avoid tricky traps, obstinate obstacles, and evil enemies. As you progress it gets tricker and tricker. Put your cognitive skills to the test. Race against the click and collect coins to earn extra points and more time.